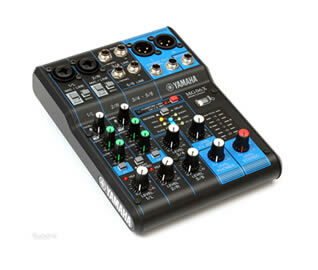 A small form 6 channel mixer with 2 D-Pre Mic inputs for super-quiet operation. It includes +48v phantom power for condenser mics and XLR balanced outputs and a further 6 line inputs, 4 in two stereo pairs. 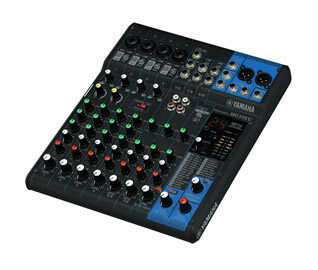 Also included are a bank of Yamaha SPX effects to further enhance your sound with no need to add in additional processors. 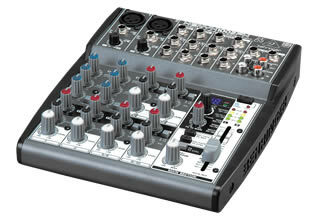 This small format 10 channel mixer has 4 D-Pre Mic inputs for super-quiet operation and three stereo channels. 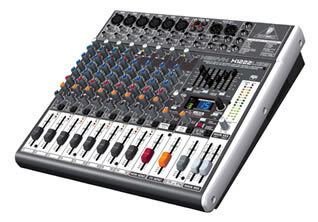 It includes phantom power for condenser mics and XLR balanced outputs. Also on the MG10XU are a bank of Yamaha SPX effects to further enhance your sound with no need to add in additional processors, and USB connectivity to make recording and connection to a computer or an iPad (via an Apple camera connector kit) easy. Ideal for duos and trios. A compact and exceedingly capable mini mixer, boasting 6 channels & effects including reverb, echo, chorus, flanger & delay. Balanced outputs to main PA. Ideal for a solo singer, duo or small acoustic band. A full featured mixer with 16 inputs and USB connectivity, full sized faders, a stereo 7 band graphic equaliser and full on-board effects including reverb, echo, chorus, flanger & delay. 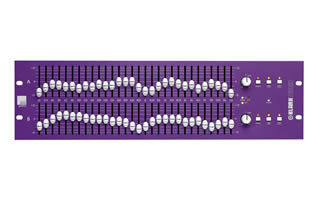 Balanced XLR outputs to main PA.
12 mono channels and 2 stereo channels create enough flexibility for all but the largest bands or productions. 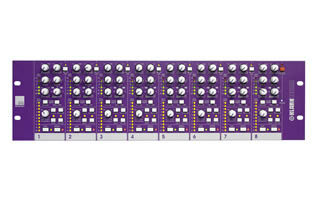 Each of the 12 main channels has an insert, 3 band EQ with parametric mid band and 2 auxes. A major benefit is the onboard 24bit Lexicon effects processor, widely regarded as the best in the business. Balanced XLR to FOH. A high-performance 22-input mixer, it features smooth, premium-quality faders with GB Series audio routing with flexible pre/post switching on each Aux, and subgroups with powerful routing and switching options as well as dedicated outputs. The console is built using tour-grade robust metal construction and top-quality components and has an internal universal power supply. It incorporates Soundcraft’s iconic Ghost mic preamps, directly drawn from the company’s top-of-the-line professional consoles, to deliver extraordinary audio quality with high headroom, wide dynamic range and exceptional resolution and clarity with a superb signal to noise ratio. It also includes a wide variety of built-in Lexicon studio-grade reverb, chorus, modulation and other effects and dbx limiters on the input channels. It comes with a 24-in/22-out USB interface allowing for multitrack recording onto a linked PC and return back into any channel strip. 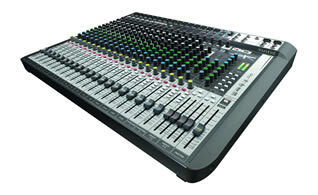 A 20 input channel digital mixer it offers the power and capability of a large format console in a highly portable, fully integrated and easy to use desk. 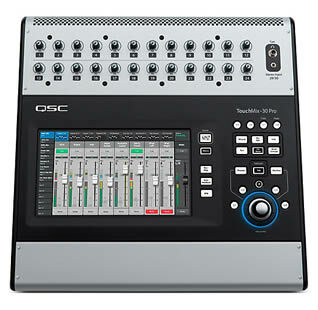 The QSC TouchMix-16 provides the user a choice of Advanced Mode operation that offers total control over all parameters or Simple Mode that provides only the most essential controls. Specifications include 4-band, fully parametric EQ with both variable hi-and lo-pass filters, as well as comprehensive dynamics processing on each input channel. 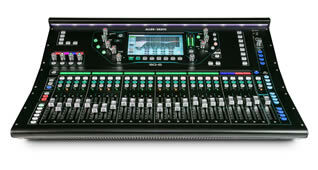 Four mix busses feed four internal, professional, digital effects processors. Comprehensive dynamics, graphic EQ, hi- pass, lo-pass and notch filters and delay are available on both the main and aux outputs and there are 8 DCA groups with mutes as well as 8 mute groups. 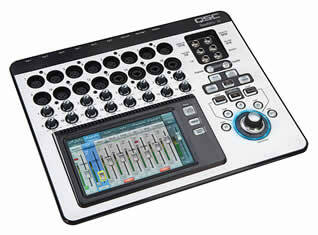 With ten auxiliary output channels, TouchMix also has ample stage monitor mixing capability. TouchMix features a comprehensive library of Channel Presets, utilising all types of instruments, popular microphones and pickups as well as multiple types of speakers systems, these presets help the user achieve great results quickly. The mixer's onboard Effects Wizard guides the user through the selection and assignment of appropriate effects while the Gain Wizard continuously monitors and displays input clipping. The TouchMix Series models are completely self-contained and require no external PC or video display. The graphic, color touch-screen provides access to all mix parameters along with a physical rotary encoder and hardware buttons. The available Remote Control App for iOS devices controls all mixer parameters and the included USB Wi-Fi adapter creates the network connection between the mixer and the hand-held device. No external network hardware is required. Equipped with 32 mixing channels - 24 mic/line, 6 line and stereo USB - and 16 outputs, the TouchMix 30 Pro contains a comprehensive library of Channel Presets which help to ensure optimal sound quality and performance for any venue. Including a wide range of instruments, popular microphones, pickups and speaker systems it allows even the most experienced engineers to produce a great mix in record time. As well as all the functions of the TouchMix 16 above, the 30 Pro is equipped with two real time analyzers on board, and a larger 10” touch screen for greater ease of use but still retains a remarkably small footprint making it very easily portable. It also supports complete wireless, remote control via any iOS or Android tablet or smartphone over Wi-Fi. 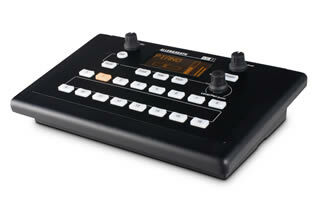 Additionally, multiple devices can be used simultaneously which allows you to duplicate the mixers features. Created to excel in demanding scenarios such as AV, corporate events, live productions and houses of worship, SQ-6 offers class-leading high-resolution 96kHZ audio fidelity and an ultra-low latency of <0.7ms. The console features 24 exceptional onboard mic preamps, plus 8 stereo FX engines with dedicated return channels and access to the renowned RackExtra FX library. SQ is a natural choice for in-ear monitor setups, providing 12 stereo mixes (configurable as groups or auxes), whilst Automatic Mic Mixing* makes it an excellent choice for conferences, panel talks and more. With 25 motorised faders this console offers easy control without needing to keep changing pages in a relatively compact package. Adding optional digital stage boxes allows access to a further 24 channels of input for larger setups. 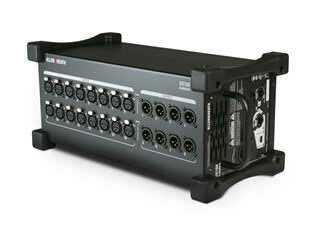 Portable audio rack with 16 mic preamps & 8 line outs. 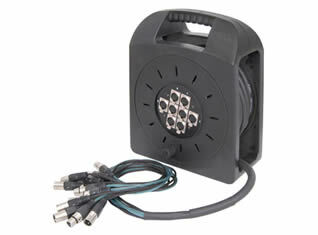 Supplied with 30m Cat 6 cable (longer available upon request) reel with EtherCON connectors. 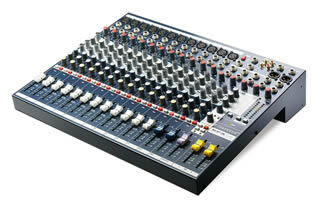 40 channel personal mixing station which can be daisy chained off DX168 stage box or run directly out of SQ-6. Headphones or IEMs not included. The ultracompact Behringer Shark DSP110 is a 24-bit multipurpose signal processor that functions as a pro-quality ULN mic preamp with +48V phantom power. It's a feedback destroyer, a delay line for loudspeaker time alignment, a user-friendly yet effective compressor/limiter, and a noise gate with "learn" mode. 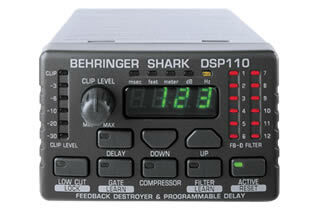 24-bit A/D/A converters and professional connectivity round out the Behringer Shark DSP110 package. Offering 31 bands of Q adaptable filtering across 25Hz - 20kHz, the Square ONE Graphic lets users control problematic frequencies that may arise within an acoustic space or signal chain. It also contains fixed 80Hz high pass and fixed 15kHz low pass filters which are ideal for increased signal control when used for monitoring or small to mid-sized P.A. systems. 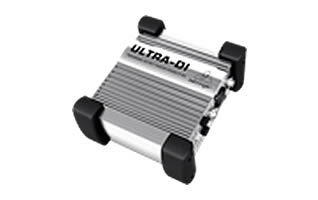 With professional 45mm faders, allowing for high accuracy and resolution. This provides eight complete channels of either compression or gating, with push button selection and LED status indication of operational mode on an individual channel basis. The compressor section on each channel includes controls for adjusting the threshold, make-up gain, attack, and release and ratio. Each channel has a sidechain band-pass filter with two different bandwidth settings for use in frequency dependent gating. Also included is an external sidechain input with LED status indication. A bypass switch sets the signal path to unity gain on each channel while providing LED status. 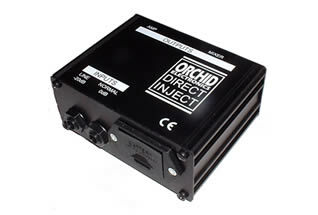 Battery or phantom powered DI box with XLR and ¼” jack inputs and XLR out. Switchable input attenuation up to +50db. A high quality and highly regarded active DI box. 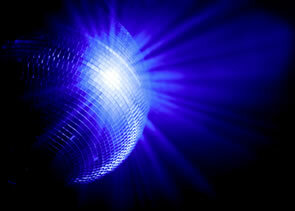 With twin ¼” jack in with different impedances and single XLR and ¼” jack out. A passive direct box designed to handle extreme signal levels without distortion it employs the world class Jensen JT-DB-EPC audio transformer delivering a smooth, warm sounding Bessel curve, reminiscent of the finest vintage gear. 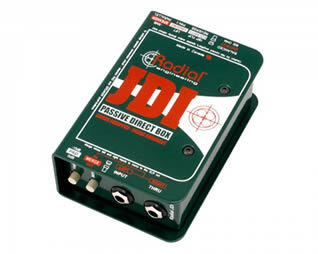 Ruler flat from 10Hz to 40kHz and with virtually zero phase deviation, the JDI delivers the natural, pure sound of the instrument without artifact. 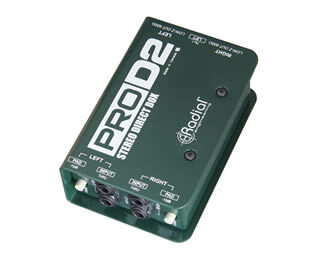 Passive stereo direct box designed specifically for keyboards with a smooth, warm sound which rounds out digital edge. Able to handle huge transients without choking. 8 sends and 4 returns on balanced multi-core XLR cable on a reel. 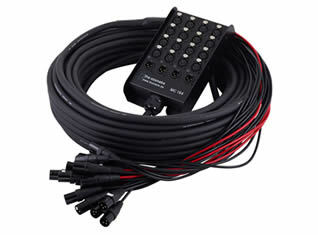 16 sends and 4 returns on balanced multi-core XLR cable. Supplied in carry bag.